The term physical disabilities is broad and covers a range of disabilities and health issues, including both congenital and acquired disabilities. Within that range are physical disabilities or impairments that interfere with a child’s ability to attain the same developmental milestones as his or her age-mates. The number of students with physical disabilities is expected to grow as medical advances continue to reduce mortality rates for infants and children. According to the Individuals with Disabilities Education Act (IDEA), a person with an orthopedic impairment, brain injury, or other health impairment who, by reason of that impairment, needs special education and related services is considered to have a physical disability. The condition must interfere with or substantially limit the child’s ability to take part in routine school activities. A physical disability or health condition need not limit activity; instead, it may involve other restrictions, such as a special diet (i.e. celiac-disease) or the student’s need to use medical equipment. The U.S. Department of Education estimates that 0.6 percent of the school-aged population has physical or health disabilities. This figure may be misleading in some ways, because it includes only those students who are eligible for special services. If medication or other assistance controls a condition, the child is ineligible. Physical disabilities and health conditions are classified as either congenital or acquired. Students with congenital conditions either are born with physical difficulties or develop them soon after birth. Acquired disabilities are those developed through injury or disease while the child is developing normally. The age at which a condition develops often determines its impact on the child. Table 9.1 lists some commonly occurring physical and health impairments. 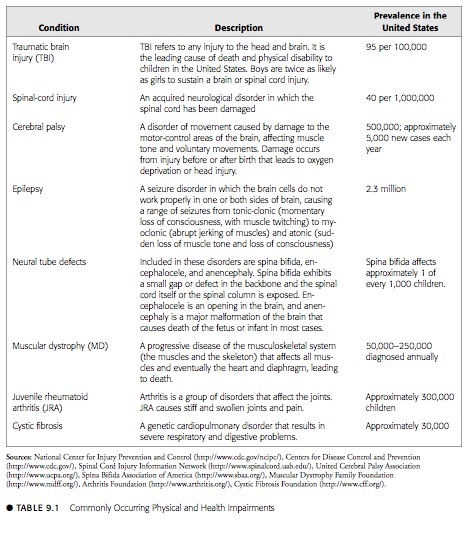 Others not shown in the table include Tourette’s syndrome, hydrocephalus, cleft palate, asthma, and AIDS. Because no such list includes all the conditions that may afflict children in your classroom, you must gather specific information about each child in your classroom and their conditions. You may hear the phrase physical and motor disabilities used in reference to injuries that inhibit movement. Such injuries typically pertain to physical disabilities involving the spine. When spinal nerves are damaged, the individual loses both movement and feeling. A quadriplegic, for example, has suffered damage to the nerves that manage the arms and legs, resulting in paralysis and loss of sensation Mr Rogers with quadriplegic child. These nerves lie within the cervical vertebrae, and damage to them causes an inability to transfer messages to the brain. A paraplegic has lost the use of the trunk, legs, or pelvic organs; this condition results from trauma to the thoracic, lumbar, or sacral spinal nerves. In both conditions, the spinal cord remains in place but is incapable of transferring neurological information. 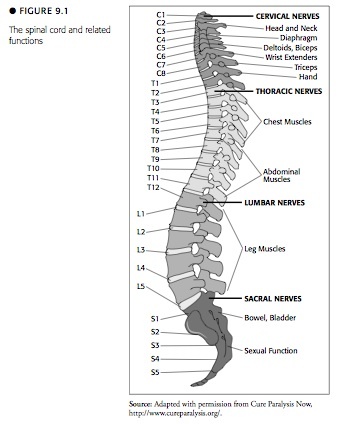 Figure 9.1 shows the placement of various types of nerves within the spine. The severity of an injury to the spinal cord depends in part on the location of the damage. Generally speaking, the higher the location of the injury, the more serious the paralysis will be. For example, in his book Still Me, Christopher Reeve (the actor who starred in Superman) explains that his injury from his horseback riding accident was between the C1 and C2 cervical vertebrae. The injury requires him to use a respirator and prevents movement from the neck down. The effects of spinal damage are further divided into levels of injury. Complete injury refers to the inability to move and to be aware of movement and sensation; the cervical nerves have lost all their ability to connect with the brain. An individual with an incomplete injury retains some degree of mobility and at least a partial capacity to acknowledge sensation and voluntary movement. A physical disability may or may not affect a child’s academic performance. Therefore, although you might not need to make curriculum adaptations for such a student, you may need to modify performance requirements or implement adaptations to allow the student access to instructional materials. Children who often miss school because of their medical conditions may require adjustments to the pace of instruction or to the amount of information they must learn. Students with physical disabilities often need special professional services outside the classroom. Orientation and mobility specialists can assist the student in using a wheelchair. Occupational therapists can teach daily living activities such as dressing, and physical therapists can help with walking or keyboarding skills. Doctors and nurses may be involved in this student’s life to help with mediation and pain management. Click here to learn more about Physical Therapy in schools. Is a horse the best therapist for physical disabilities? Most of all, as a classroom teacher of a physically impaired student you must stay informed on three points: (1) warning signs that the student needs help or is having a problem (2) the student’s limitations and their influence on defining reasonable expectations, and (3) how to handle an emergency brought on by the student’s condition. Take the time to learn as much as you can about the child’s condition while keeping in mind that the student is an individual, not a health condition. You shouldn’t be afraid to talk to the student about what works or doesn’t work for him or her, but seek first an understanding of the student as a person. Involved medical and therapeutic specialists can give you some insight into classroom modifications that will ensure the greatest opportunity for success. After a national survey, it seems as though most kids who are physically handicapped that take part in a physical activity or sport, take up swimming. Over 37% of disabled adolescent children take up swimming than the general population (30%). Kids with physical disabilities can float and therefore have more confidence in the water. Many places offer swimming to the disabled and many of these kids can learn how to swim. Accommodating a student with a physical disability requires you to carefully examine your classroom in order to make everything accessible. This might mean lowering the pencil sharpener or arranging furniture to make aisles easy to navigate in a wheelchair. This is another opportunity to think about the Universal Design for Learning, a concept mentioned in earlier chapters. In this case, if you consider all your students in terms of their range of motor skills, you’ll begin to think beyond the group labeled “physically disabled.” You will see students with a range of, say, physical coordination or artistic skill, and you will design lessons that offer alternatives to kinesthetic learning or to demonstrations of learning that require fine motor skills. One of your greatest challenges will be to ensure that the student with a physical disability is comfortable in all the learning situations to which your class is exposed. For example, when planning a field trip, you need to confirm that the location is wheelchair accessible, that it has parking nearby, and that the entire class can participate in the activities. Most museums and sites of interest are accessible to students with physical limitations, but always confirm access. It can be distressing to everyone, including you, to discover on the spot that a location or activity is inaccessible. Set up a buddy system so that another student can take notes for the student with a physical disability and assist him or her with other in-class requirements. Arrange the room so that everyone can move around easily. Have students with difficulty speaking (as is the case with cerebral palsy) use an alternative presentation format in place of oral reporting. Make sure all activities include all students. Be flexible and accept suggestions. Talk to the student about what he or she likes to do and can do. Identify a student’s areas of expertise. Out of necessity, for instance, the student may have become extremely proficient with the computer, and perhaps he or she can share that knowledge with the class. Incorporate into lessons and/or wall hanging examples of role models with physical disabilities. Are Teachers Prepared for Inclusion of Physically Disabled Students?